Is there anything more wonderful than a creamy chocolate truffle? 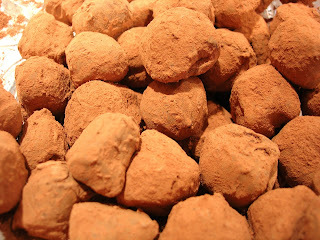 Seriously guys, I love chocolate in any form, but there's just something so wonderfully luxurious about truffles. A few years ago I went through a bit of a "truffle phase." I made numerous variations to a basic truffle recipe, trying to come up with the perfect truffle. I even had a little notebook that I carried around with me, where I wrote down all of my ideas for different kinds of truffles. You name it, I probably have it written down in that little notebook! I could have opened up a chocolate shop and sold nothing but truffles, but there was one little problem. I couldn't find what I considered the Perfect Truffle. Deep, rich chocolate ganache, so creamy and smooth that it completely melts in your mouth as you bite into it. I wanted it to have a chocolate shell, but not something as thick and overpowering as you find on most truffles. Something like that would just take away from the silkiness of the filling. School started up again and my obsession got pushed onto the back burner, until last year when I stumbled across something wonderful from Deb over at Smitten Kitchen. Those truffles looked so beautiful and perfect, it was daunting. It took me a year to finally work up the nerve to try the recipe. And guess what - they were so easy! Not at all as intimidating as I thought. Ooh, and they were everything thing I had dreamed of. I'm going to have to pull out that notebook and start trying my variations on a basic truffle using this technique. Set aside 3 oz. of the chocolate for later. Finely chop the remaining 8 oz. 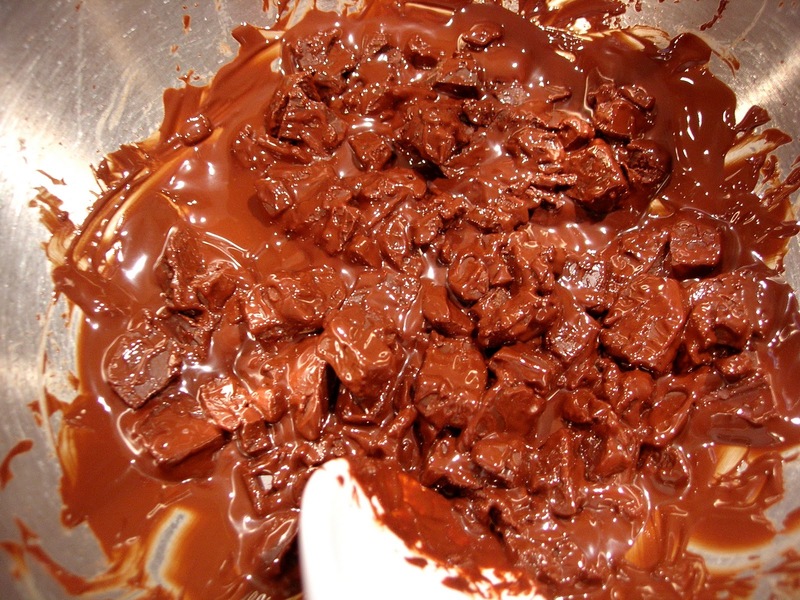 of chocolate and put it in a large mixing bowl. In a small, heavy bottomed saucepan bring the cream to a boil. Linxe boils the cream three times because he thinks it makes the ganache last longer. I didn't - there was no way these truffles were going to need a long shelf life. If you do boil it three times, cool it between simmering and start with a little extra cream to make up for any evaporation. Pour the hot cream into the bowl over the chocolate. Use a spoon to smash up any big pieces. 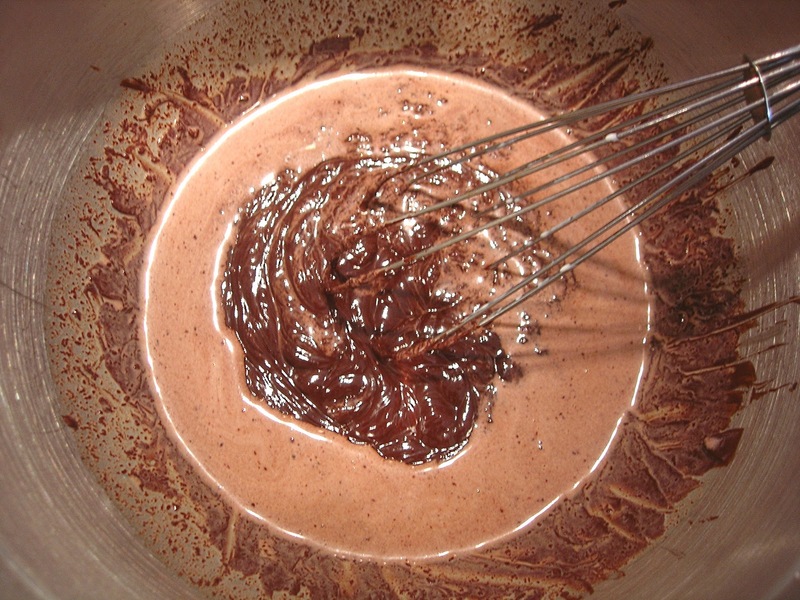 Let the ganache stand at room temperature until it's thick enough to hold a shape, about 1 hr. Or, if you're impatient like me, put it in the fridge for about 20 minutes. Be sure to pay close attention so it doesn't get too hard. Using a pastry bag with a 3/8 inch opening, pipe into mounds, about 3/4 inches high and 1 inch wide. Finish with a flick of the wrist to soften the point. Freeze until firm, about 15 minutes. Meanwhile, set up an assembly line for the next part of the truffle-making-process. It can get messy, so it's definitely helpful to have everything set up before hand. Station 1: frozen truffles; Station 2: melted chocolate; Station 3: cocoa powder; Station 4: small mesh sieve or strainer and empty bowl; Station 5: tray or other container to hold the finished truffles. Chop the remaining 3 oz. 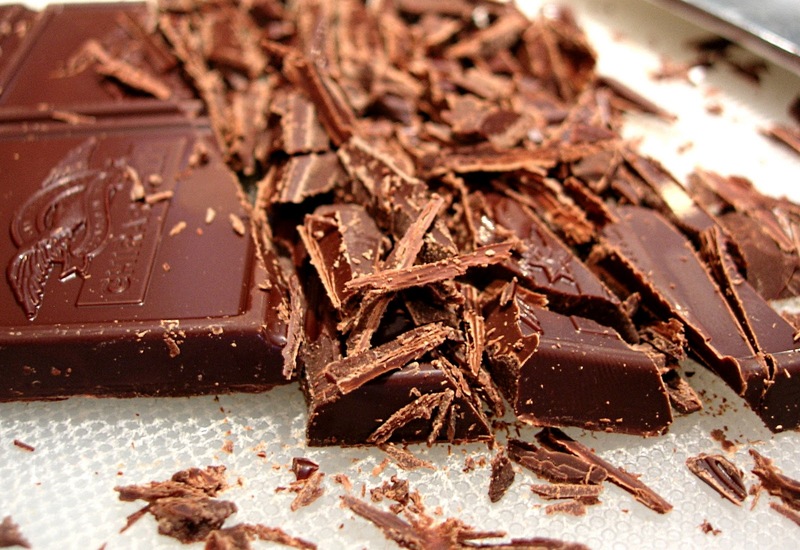 of chocolate and put in a bowl. Melt over a pot of boiling water. When melted, set up in Station 2. Now comes the fun part. Put on your latex/plastic gloves. 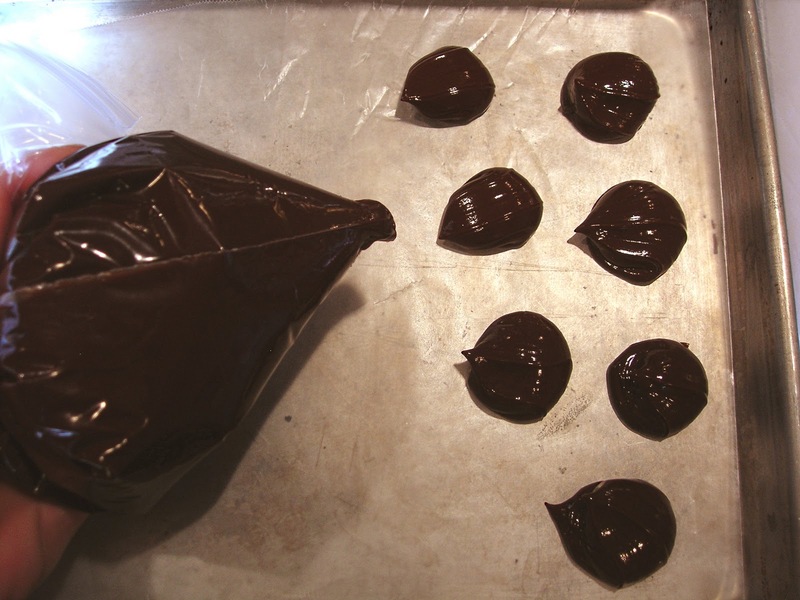 Smear some melted chocolate on a gloved hand and gently roll each chilled truffle in the chocolate. This is the secret of the truffle and what makes it so perfect - that light, delicate coating of chocolate. Trust me - you'll understand when you try them. 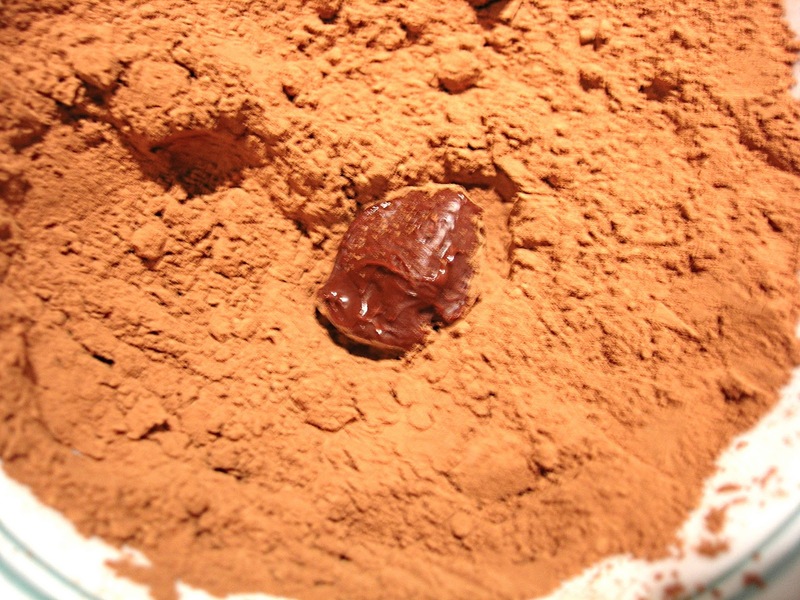 Drop the coated truffle in the cocoa and use a fork to toss it around until covered. Dig it out like a truffle, freshly dug from the earth. 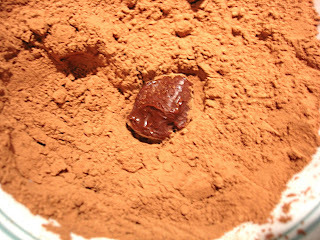 Shake the truffles in the sieve to eliminate any excess cocoa. Store the truffles in the refrigerator. These make lovely gifts packed up in little boxes. With the holiday season right around the corner you should make a few batches (don't double the recipe) and send some to all your friends. This recipe makes approximately 60 truffles. Should I also mention that if you were to buy this many they'd cost over $70? Yet another good reason to make your own! I'm a firm believer that good design and good food go hand-in-hand. With a little bit of good design, our homes can become a place of peace - a refuge from the storms and beatings of everyday life - a place where we know everything will be ok. Pair that with delicious and wholesome food, and you've got yourself a little piece of heaven. Tell me what you're thinking, or just say hello! Emails and comments make my day!